MY 1ST GUEST WAS RAJIV..! Essex born R&B Singer, Rajiv is rapidly making waves on the UK music scene, with tracks such as 'Back & Rewind' which became very popular. During his time at University, Rajiv honed his skills, not only as a singer, but also as a skilled producer. Rajiv's love of music and his exotic good looks are owed to his Mauritian Father and Trinidadian Mother. MY NEXT GUESTS WAS REPRESENTATIVE FROM GUBA AWARDS..! In the Middle is Nana the Winner of Top model of Color UK and her representative, and on the very left is Essex born R&B Singer; Rajiv. THEN AWARD WINNING MALE MODEL & ACTOR..! Phoenix James is a multi-talented award winning male Model & Actor. He has been a photographic, promotional & catwalk model for various brands including advertising campaigns for NHS, Kodak, Ford, Coca Cola, FIFA, Strongbow, Virgin Money, The London Marathon, Sky Sports and Samsung. Phoenix James, played a number of lead acting roles in short & feature length films many of which have screened at recognized film festivals across the world including the Cannes and Sundance film festivals. He has also played featured acting parts & Cameo roles in cinema & DVD released feature films and appeared in television productions for BBC One, BBC2, BBC Three, ITV, CH4, Living & Sky TV. NEXT WAS MISS NUBIAN PAGEANTS UK AND FIGURE NO. 8...! Love It. Sporah, Catwalk Professoe and Jaqueline Wabara. Jaqueline Wabara ( CEO Miss Nubian Pageant ) and Catwalk Professor a.k.a Mr Fierce. Miss Nubian is for beautiful, talented, ambitious UK based ladies from Sierra Leone, Jamaica, Nigeria, Barbados, Kenya, St Lucia, Ghana, Republic of Central Africa, Trinidad, Congo, Eritrea, Mali, South Africa, Ivory Coast, Zimbabwe, St Kitts, Uganda, Grenada, Gambia, Guyana, Angola, and Sudan. Catwalk Professor a.k.a Mr Fierce and Sporah Njau. MR FRANCIS MATHEW WHO IS KNOWN AS THE CATWALK PROFESSOR A.K.A MR FIERCE IS A QUALIFIED MODEL TRAINER AFTER WINNING THE STARPIC MODEL CONTEST 1996 ON HIS NATIVE ISLAND OF ST MAARTEN HE WAS GRANTED A SCHOLASHIP TO STUDY THE ART AT OPHELIA DEVORE MODEL SCHOOL IN NEW YORK CITY WHERE HE WAS AWARDED "BEST RUNWAY MODEL". Click here For More Info..
Then, we went a little bit crazy..! He goes Noooooooo, leave my hair alone.! Sporah, I will..... the hell out of you..! No Mr Catwalk, am just trying to clean your make up..! Nooooooooo Sporah, leave me alone man.! Come on Mr Catwalk, you know I love you.. I love you too Sporah..! Scout ...... Please Click Here For More About Catwalk Professor. MEET THE GIRLS: THE WINNERS OF FIGURE NO 8 & MISS NUBIAN UK 2011 FINALIST..! I had such a wonderful day with you guys..! Hope to have you again. THEN THE GIRLS HAD A TASK TO SELL A PRODUCT ON THE SPORAH SHOW..! Yamisi from Figure no 8 Model was our GOLD Winner. Yamisi holding her GOLDEN prize. Well done you and keep up the good work. THE 1ST RUN UP WAS CHERRY RED RACHY FROM FIGURE NO 8 MODELS..! Cherry Red Rachy showing off her beautiful RED prize. OUR 2ND RUN UP WAS BARBRA FROM MISS NUBIAN UK 2011. 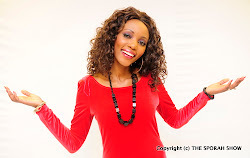 Barbra is representing Uganda on Miss Nubian UK 2011. Is it true Sporah, I've wan this..? She is lovely..! Isn't she? At last i met you Sporahhhhhh..! Lets take a picture my love..! Camera man what are you doing? MEET ALICIA GRACE FROM BARBADOS..! Love her height 2, so elegant. No, i think i love her skin colour more, she is a real African Queen. THE BEAUTIFUL FATMATA REPRESENTING SIERRA LEON..! Sporah and Fatmata after the show..! I love your style..! The Shoe. How long did you take to wrap it girl..! I love it, it looks so beautiful on her. One More Pic Camera Man Please. MEET MAKE UP ARTIST KAREN SALANDY..! Sporah Njau and Karen Salandy. Karen Salandy is a make up artist Launch K-bell cosmetic services. Resident Make-up director for Yana cosmetic. Head MUA for Miss Trinidad +Tobago UK. Train and Teaches The Art of Head wrapping. BEFFTA nominee short listed for Best MUA. OOH NO IS RAJIV AGAIN..! 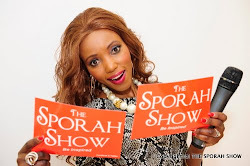 YOU CAN GET THE REAL ACTION ON THE SPORAH SHOW THIS MONDAY 10:30PM ON BEN TV SKY 184..! IF YOU MISS IT, YOU MISS OUT. THIS MONDAY 24TH OCTOBER 2011... STAY TUNED. OOH I love this one you all look great. 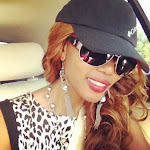 Sporah u r beautiful.I love u and ur show.u r such a natural,u r funny and always u make me laugh. Hello Catwalk professor, I love what your doing for women in the UK, but trust me the African women in AFRICA needs you more than you can ever think! I mean some of these women in Africa can barely walk on the street with heels, let alone the Catwalk!. When it comes to high heels Shoes in Africa, its a NO NO NO. Keep up the good work and please consider our African ladies. I loooooooove the fighting between THE CATWALK DIVA and THE CHAT SHOW QUEEN.